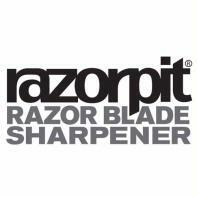 The RazorPit blade sharpener extends cartridge razor blade life from around 5 shaves to 60 - 150 shaves from one blade. Cartridge razor blades are ridiculously expensive and they cannot be recycled resulting in landfill and ocean pollution, RazorPit saves you money, protects the environment and delivers closer and more comfortable shaves. Most men think their cartridge blade goes blunt quickly resulting in poor quality shaves and post-shave skin irritation. In actual fact, the real problem is not the blade losing its edge, the real problem is skin cells and shaving lather from gels, foams, creams and soaps getting trapped between the blades and sticking to the edge of the blades causing them to become thicker and thereby dull. RazorPit solves this problem by using friction to remove the residue of skin and lather that sticks to the blades. The RazorPit working surface is made from a thermoplastic elastomer which is a type of silicon, this material has a high level of friction and a high level of softness which is perfect for getting between the blades and removing the residue. Think of the huge amount of money you can save with a RazorPit. A Gillette Fusion blade costs around £2.14, most men change a cartridge blade weekly, this amounts to an annual spend of £111.28. An average RazoprPit user will get around 100 shaves from a cartridge blade reducing the annual spend on blades from £111.28 to a minuscule £6.50 annually (based on a user shaving 6 x weekly). Can you afford not to buy a RazorPit? The RazorPit Slide has a softer surface than the original model giving closer contact with the razor blade, improving the sharpening process. The RazorPit Slide is compatible with all razor blades including cartridge blades, disposable blades and DE safety razor blades. More than 93% of Razorpit customers are so happy with Razorpit that they would recommend it to others. If you are one of the few who do not find Razorpit living up to its promises, we would be happy to give you a full refund. Using the RazorPit couldn't be easier. Simply apply a layer of shaving lather onto the horizontal surface of the dry RazorPit. Then, while applying pressure push the razor forward on the silicone plate 3 or 4 times. This removes the dirt, hair and residue from the blade surface maintaining its sharp edge. The RazorPit Razor Blade Sharpener is the best guaranteed return anywhere on the planet! If you have to use a cartridge blade razor to shave, this will help you save 100s of pounds every year.